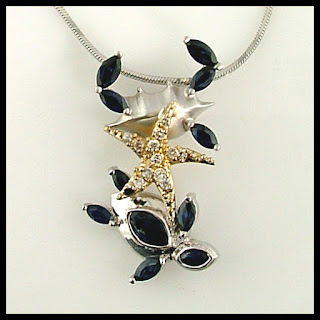 We restyled an 80’s era necklace into a cool, funky sea life pendant. We all have those pieces of jewelry in the bottom of our jewelry box that we don’t wear. We call them jewelry ghosts – they randomly appear, we stare at them in disbelief (“Did I really wear that!”) and quickly close the lid. Take that 1980’s style blue sapphire and diamond necklace for example. Your remember it – the one that came down to a pointed V (and never was straight), made of 14k yellow gold with a herringbone chain (that kinked the first time you wore it) with clusters of sapphires and diamonds. It was The Necklace. You wore it to every wedding, holiday party and formal event. And because you did, you can’t bring yourself to get rid of it. And you shouldn’t – we have a solution. Restyle it into something current, modern, fun-to-wear! Marcia had one of those necklaces. Even though she still works outside of the home, she doesn’t have to dress up like she used to. And she just loves the beach. So, we created a fun, whimsical, sea-life themed pendant using her gemstones. With CAD technology, we were able to measure her sapphires and diamonds, then make the custom pendant around those stones. We even took her old gold as trade-in towards her new custom jewelry, making this piece even more affordable. The result: A gorgeous custom pendant that she can wear everyday, not just for formal occasions. And the best part? We all had fun designing it! Maybe the beach isn’t your thing. It doesn’t matter. Make an appointment at either of our two Scott’s Custom Jewelers locations – Columbus, Ohio, 614 336-4111 and Akron, Ohio, 330 865-9595 – and we’ll help you design a piece that’s perfect for you. Because custom jewelry is our passion, and it will be yours also. So don’t be afraid of those ghosts – they have a second life at Scott’s Custom Jewelers.